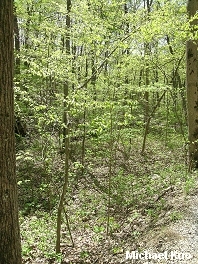 Eastern understory tree with bluish gray, smooth, sinewy bark and finely toothed leaves. Note: Common names for this tree and Ostrya virginiana are confusing. Both trees are sometimes called "ironwood" or "musclewood," and Ostrya virginiana is often called "hop hornbeam." 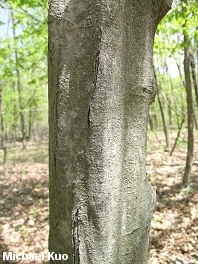 While the leaves of these trees are similar, they have very different (and very distinctive) bark. Habitat: Understory tree in various forest communities; frequently in moist soil but also found in dry sites. Stature: To 40 feet high and 1 foot in diameter; with a flat-topped crown when mature and relatively free of interference from the canopy. 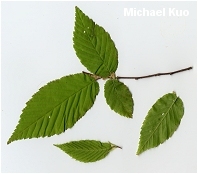 Leaves: Candle-flame-shaped; finely, doubly toothed; dark green above; paler below; symmetrical at the base (unlike the leaves of elms); the bottom lateral veins not forked (unlike the leaves of Ostrya virginiana). Bark: Bluish gray; smooth; distinctively taught and sinewy (reminiscent of the veins and tendons in your wrist when you clench your fist). Several species of Leccinum, and probably many other mushrooms that are currently assumed to be mycorrhizal associates of canopy trees that tower over blue beech and catch the attention of mushroom collectors.